L. Sprague deCamp, engineer, author, editor. All in all a pretty busy guy who kept writing original material into his eighties. For my purposes, what interests me most here his discovery of and fascination with swords and sorcery and his editing skills. Ultimately, I don't care that much about his manipulation and mucking about with the Conan catalog and the resultant anger directed towards him by the legions of Robert E. Howard supporters. It was the de Camp edited Conan books and his pastiches with Lin Carter that turned me on to Howard. They were cheap and ubiquitous and they're what got me going. Now, while not so cheap, the "pure" canonical Conan is easily come by, so it's all good these days. De Camp's love for Howard and the genre (and you can argue abut that all you want but he clearly loved the stuff) in turn led him to edit several excellent collections of stories in the sixties and seventies. While his Conan pastiches leave, shall we say, a lot to be desired, he did much to publicize and encourage the growth of the genre and those things are more than good enough for me. As an editor he sought to anthologize the building blocks of the genre as well as the best newer stories. 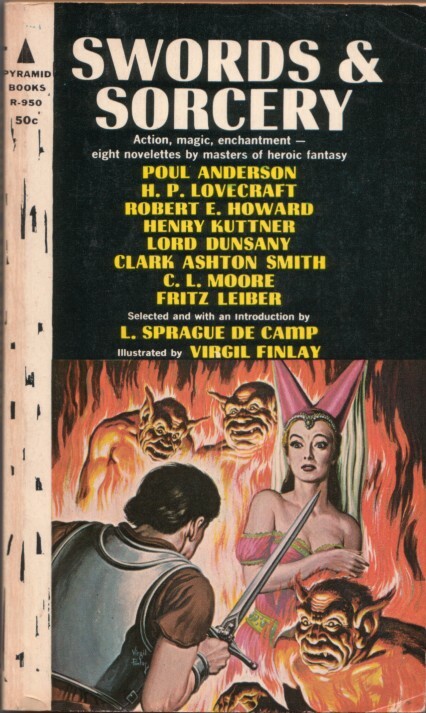 "Swords and Sorcery", edited by De Camp, and published in 1963 is accorded the honor (at least on wikipedia) of being the first anthology in the genre. It contains stories by Lord Dunsany, Howard, Kuttner, Lovecraft, Smith, Moore, Leiber and Anderson. 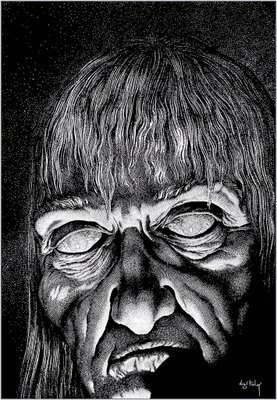 Each story is also illustrated with a stunning Virgil Finlay illustration (he also did the cover art). It's a decent mix of foundational and contemporary writers. They're all reprints and they're all at least good. It represents about a good a cross section of the genre in 1963 as possible, though Michael Moorcock's Elric would have to wait until the follow-up collections. But we do get Conan, Jirel and Fafhrd and the Grey Mouser as well as Prince Raynor. That's about as great a place any new fan could start. And then there's Poul Anderson's wily minstrel Cappen Varra. Later he would go on to become one of the first denizens of Robert and Lynn Abbey's Thieves World series. When first met he's a man stuck in the miserably cold and barbarous north after undertaking a vain effort to enrich himself at northern lord's court. He had hoped his cultured southern songs would win over his new employer and his followers. Only the lord isn't bored by Cappen Varra's songs but he's cheap. When he decides to make a visit across the sea he drags the minstrel along into the icy night. There's not all that much plot to the story and it reads more like a fairy tale than the more typical blood and thunder story. Trapped on his employers' boat in a storm, Cappen Varra's forced to risk facing a troll when he's sent to explore lights on a lonely island and acquire fire and dry kindling. Fortunately, Cappen Varra wears a silver amulet he was given by a wizard for past services that he believes will protect him from trolls. All he has to do to activate it is voice three truths in the face of danger and he will be guarded against danger. With this in mind he lands on the island with no fear. Once there he does indeed find a troll and fire and another thing of great value. Cappen Varra clearly isn't the sword wielding barbarian but instead he's cast in the trickster mold. His discomfort as a southern sophisticate stuck with on a ship full of pseudo-Norsemen is amusing. His fast talking approach to the troll is as satisfying to encounter as Conan's sword technique is toward a Pict. I like Poul Anderson's excursions into fantasy. From the fairytale dream world of "Three Hearts and Three Lions" to the utter darkness of "The Broken Sword" and "Hrolf Kraki's Saga", his fantasy novels are excellent. If you haven't yet read "The Broken Sword" you need to now. That's all I'll say about that for the time being. "The Valor of Cappen Varra" is a fun story in a fun collection. The fairytale atmosphere is a great echo of the fireside tales of the skalds and bards (and griots) that are the ultimate roots of heroic fantasy. The book can be found on Amazon for $3 plus the usual shipping and handling costs. It's worth it if you don't have the various stories in other collections.